DMF International recently completed the installation of several high speed folding action doors at a combined emergency services building. DMF installed the large fast action folding Efaflex SFT doors to meet the client’s requirement for a door type that could not only provide security, but also function with a quick opening action, together with high performance reliability and good wind pressure tolerance. The high speed action results in doors opening fully in a matter of seconds, saving time in critical emergency situations. The Efaflex SFT high speed doors not only fulfil this important functional requirement but also offer an architectural finish to the building. The Efaflex doors are designed with a bi-parting action, and feature framed windows for maximum visibility and light, with sensors ensuring safe use by operators. The soft start-stop action also results in a very smooth and quiet operation. 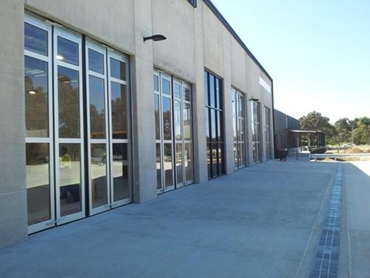 DMF has supplied both the folding type door, and high speed spiral roll doors to a number of clients requiring fast action security doors, including carparks, airports, warehouses, and even prisons. DMF is the exclusive distributor of the German produced Efaflex door products in Australia.